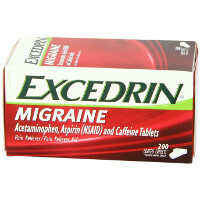 Your doctor may recommend that you try safe and effective OTC migraine treatment Excedrin Migraine before a more expensive prescription drug. In clinical studies, after taking Excedrin Migraine, patients with moderate to severe migraines experienced effective migraine relief with just one dose, lasting relief, and major improvements in their ability to take part in normal activities. This is the only med that helps my daily headaches.